Two measures of India’s inflation, the consumer and wholesale price indices, posted faster than expected inflation in April. The year-on-year rate of CPI inflation accelerated to 4.6% in April from 4.3% in March. The corresponding figures for WPI inflation were 3.2% and 2.5%. The consensus forecasts were 4.4% CPI inflation and 2.9% WPI inflation. Housing, healthcare and transport components were responsible for higher CPI inflation, while the WPI inflation tracked oil prices higher. What matters more for central bank monetary policy is CPI inflation. We consider the Reserve Bank of India’s (RBI) downgrade of its inflation forecast at the bi-monthly policy meeting in early April to be premature. The RBI forecasts CPI inflation in a 4.7-5.1% range in the first half of FY2019, revised from 5.1-5.6%. Higher food, utilities and transport prices will likely push inflation above this range within the current quarter. Among other factors contributing to India’s rising inflation is the transmission of higher global oil prices. This transmission is amplified by the weakness of the currency. As things stand, there is no near-term respite from rising inflation. We see a greater upside risk to our 4.9% full-year inflation forecast for FY2019. Trade data for April is due today and is expected to reinforce the uptrend in the trade deficit. We forecast the April deficit at $14.5bn, up from $13.7bn in the previous month. Consensus is for an even bigger deficit of $15.0bn. Rising oil imports are pressuring the trade deficit. 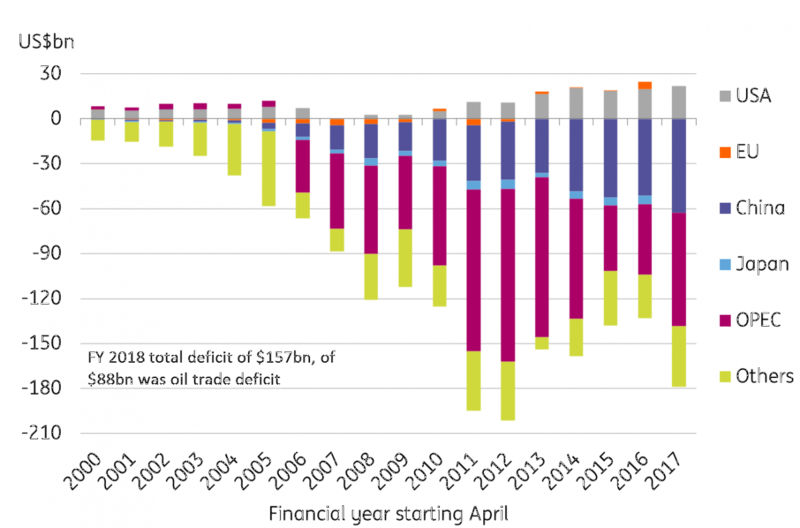 The total trade deficit widened to $157bn in FY2018 from $109bn the previous year. More than half of this rise was from oil. Rising global oil prices will sustain this trend in the near-term. By destination, China was the biggest source of India’s trade deficit (see figure). Elevated inflation and persistent currency weakness could nudge the RBI toward tightening. However, the consensus within the six-member policy committee is still tilted toward a policy status quo. We expect a decisive shift to tightening at the August meeting, when we forecast a 25bp policy rate hike. But for now, the data will maintain the weakening pressure on government bonds and the Indian Rupee (INR). Recent RBI support to local bond markets is proving insufficient, while increased liquidity infusion by buying bonds is also adding to further currency weakness. We do not see an easy way out of the trap. Our year-end forecast of USD/INR at 68.30 (spot 67.5) is subject to continual upward assessment in this environment.